The East Side History Club thanks Ann Waidelich and Sara Preez and family for their program about Karl and Evelyn (Olsen) Milroy. When New York publishing was enjoying its mid-century boom, the couple inhabited an artsy world of high-fashion models and magazine illustrators. But their lifestyle–an apartment on Manhattan’s Upper East Side, weekends at the country house in Connecticut–was not to last. Their personal history is entwined with the social history of changing public tastes and technology. A post-World War II surge in demand for advertising graphics and magazine illustrations gave Karl the opportunity to move from Wisconsin to New York City. Models were needed to pose for those illustrators during the boom–fashion photography had not yet replaced sketches. Karl’s stylish wife Evelyn was discovered by none other than Richard Avedon while walking the streets of New York. Soon she was in as much demand as Karl, posing for him and other illustrators. But the 1950s proved pivotal for American illustrators–and for Karl and Evelyn. The decade began with strong demand. But the advent of television led to a decline in magazine advertising, and fewer illustrated pages. The age of the illustrated short story gave way to the teleplay, and many magazines went bankrupt. Those that survived switched to photography with its greater realism. Illustrators were out of luck. Models were better able to survive the transition, but Evelyn had reached “a certain age” and she, too, experienced a professional downturn. And that, in a nutshell, is the story of two East Side kids: Karl and Evelyn Milroy. Evelyn Olson and Karl Milroy on their wedding day in 1939. Sara Preez’ husband Ralph was Karl Milroy’s cousin. Because Evelyn and Karl had no children and because Ralph and Sara Preez had remained good friends with Karl, they were the recipients of some of Karl’s art work after he died, and many of Evelyn framed magazine covers and many beautiful photographs of her modeling. These were on display at our November 2012 meeting. Karl Milroy Jr. was born on March 7, 1913 to Karl Milroy Sr. and Lillian Homer Milroy. Karl Sr. was the manager of the Schenk-Huegel store’s grocery department. He was also their window decorator and was well known for his displays of merchandise. Later he worked for the Foss Royal Blue grocery across the street. Lillian was a commercial artist at Simpson’s Apparel Store in downtown Madison. The family lived at 1614 Rutledge St.
Karl Jr. graduated from East High School in 1931 and attended art classes at the University of Wisconsin in 1931-1932. 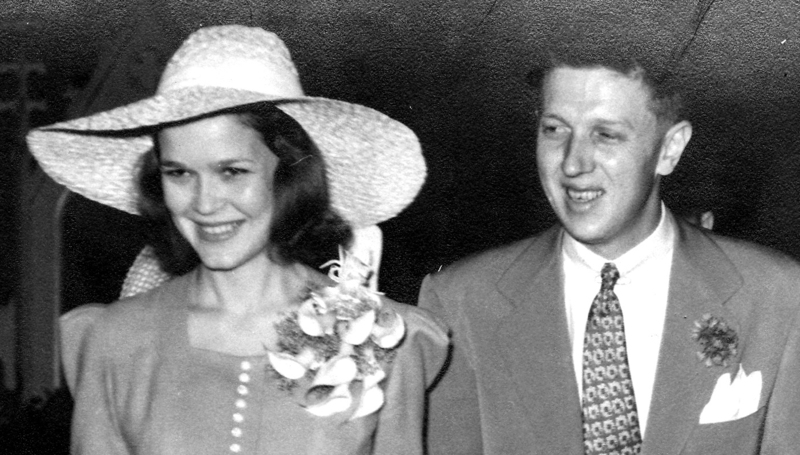 Karl married his high school sweetheart Evelyn Olsen in Trinity Lutheran Church on July 27, 1939 and they moved to Milwaukee where Karl had a job at the Milwaukee Journal. Karl enlisted in the Navy in March 1943. He was assigned to the Navy Bureau of Aeronautics producing training films used to distinguish between Allied and enemy airplanes. When he was discharged from the Navy in 1946, Karl and Evelyn moved to New York City where he joined the Charles E. Cooper Studio, then the country’s top commercial art firm, which employed about 30 illustrators to draw for the advertising industry. But by the late 1950s both Evelyn and Karl’s careers were in decline, which caused their marriage to fail and they were divorced in 1960. Karl returned to Madison and worked as a commercial artist for the Ray-O-Vac Company in their package design and creative advertising art department. Karl remarried and he returned to New York to work for the Foote Cone Belding Advertising firm for about 9 years. His second marriage failed and he returned to Madison, once again working for Ray-O-Vac. He retired about 1985. Ralph and Sara Preez became friends with Karl about this time, visiting frequently. Karl moved to the Wisconsin Veterans Home at King, Wisconsin in November 2002, where the Preezs continued to visit him. He enjoyed the fresh audience for his stories of life in New York City. The people who cared for Karl created to display of his art work; Susan Lampert Smith of the Wisconsin State Journal wrote a feature about it, much to Karl’s pleasure. He died Dec. 1, 2005 at the age of 92. Evelyn was born on June 14, 1915. After her father’s death she and her mother Mayme lived at many different addresses on the East side. Evelyn attended Hawthorne and Emerson grade schools and then went to East High School starting in the 7th grade graduating in 1933. She attended the University of Wisconsin and graduated in June of 1938. After graduation she taught art one year at East High School before marrying Karl. After a honeymoon in northern Wisconsin they moved to Milwaukee where Karl had been working as an artist for the Milwaukee Journal. When Karl entered the Navy Evelyn stayed in Milwaukee working as a model for Gimbels and other stores until his discharge and their move to New York. After Richard Avedon stopped her on the street and asked, “Did you ever think of being a model?” she became one of New York’s top models. She was represented by the John Robert Powers Agency. She modeled in fashion shows but preferred posing for fashion photographers, soon joining the ranks of cover girls. She was 5’6” with a 22 1/2” waist and 33 1/2 “ bust and hips. The established top rate for models a that time was $20 per hour. As part of her modeling work, Evelyn traveled the world, including to trips to Japan with several other John Robert Powers models at the request of the Japanese fashion industry. The girls displayed “Western clothes” to the women of Japan who were becoming interested in Western fashions after World War II. When Evelyn and Karl divorced in 1960 she went on to marry a mutual friend, Bob Davis. They moved to Chicago and later to Crystal Lake Illinois. Evelyn died on August 11, 1980 at age 65. Two East Side kids made it BIG in New York. Karl Milroy started out as an illustrator for the Milwaukee Journal and went on to create drawings for covers of national magazines. He later did artwork for Ray-O-Vac. His wife Evelyn Olson became a high fashion model in New York City. 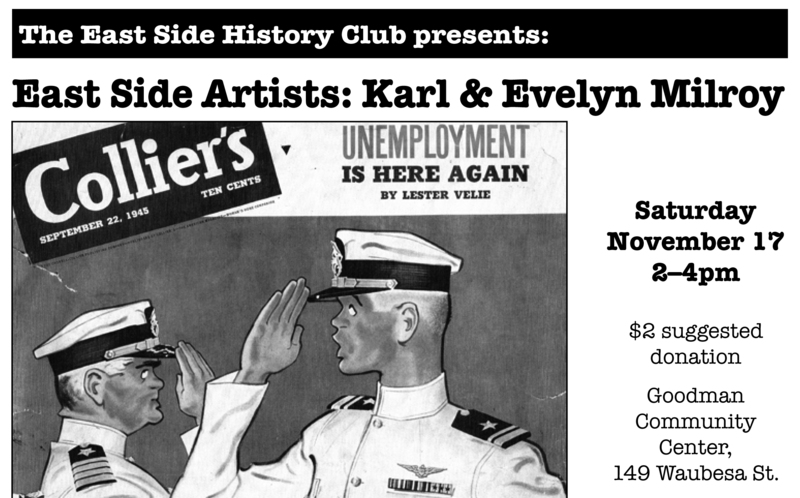 Karl’s friend Sara Preez has a collection of Karl’s artwork and Evelyn’s modeling photos to share with the East Side History Club. Do you have artwork by other Madison artists? Bring a piece to share. Photo: Colliers cover by Karl Milroy.